This paper argues that flying and taking the train compares in terms of energy - can this really be true? I am thinking that energy is a reasonable measure of sustainability although comparing emissions might have been more relevant if sustainability was the goal. The figure can be found in this report from Swedish IVA, and is based on the freely available (although in Swedish) calculator found here. If one was to try to convert the figures above to energy, as the paper above argues, it would be hard to imagine an energy mix that reversed the picture. If we first concentrate on the construction component, it could be argued that both construction processes have a similar emission per energy during the pre-operational phase. 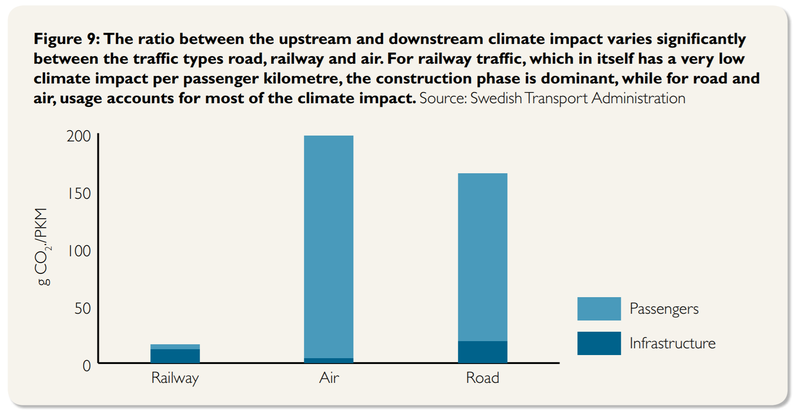 Thus it is hard to imaging the construction emissions for rail becoming much bigger than for air travel. Second if we look at emissions during operation, these are really then there are no current economically feasible ways to make flights significantly less emission intensive. However, it might be the the train below is for the Swedish energy mix which has 100 g CO2 per kWh. However if we look at comparisons of emissions during operations for diesel trains and flights, one needs to travel consistently at quarter-full carriages to compare to flights. So if you are on all diesel the benefit of travelling by train is not that big. But at the same time it is important to also show the authorities and the investors that people want to take the train, the likelihood is than higher that they will electrify them (which makes sense economically too as renewables are getting cheaper). This answer also debunks the answer to this question and I would be happy if anyone could link to this answer from that question (I am short on points to do so myself). Firstly, that it doesn't compare like with like. Air travel is compared with commuter rail, and urban light rail. This is, perhaps, representative of the uses of such modes in the USA, but isn't really helpful. I suspect - but cannot be sure - that this disadvantages rail, and that a comparison of intercity services might come out more in rail's favour. (short distance rail services are likely to be domianted by acceleration rather than cruise, and hence will have higher energy consumption in use - but it could also work the other way, as arguably more passenger-km may be obtained per km of infrastructure than on intercity routes. Plus, higher speeds are more expensive.). Secondly, despite this probable disadvantage, rail still comes out on top in terms of energy per passenger km and greenhouse gases. So the short answer to your question is "no" - the paper shows that rail beats air on energy consumption, even under the possibly-unfair comparison made. Rail does lose out to air on NOx and SO2, depending on which rail system is considered, but this appears to be down to the energy mix in the local power grid - where fossil fuel power stations will tend to burn heavier, dirtier fuels than aircraft do. As electricity supply is decarbonised, this will naturally improve. What this paper doesn't consider, when it comes to emissions, is where those emissions are made. IANAatmospheric scientist, but my understanding is that greenhouse cases released in the stratosphere are more damaging than those released at sea level - so this may tip things more in rail's favour. Not the answer you're looking for? Browse other questions tagged transport fuel-efficiency or ask your own question.